The BJP, Deputy Chief Minister Parameshwara alleged, was trying to destabilise the Karnataka government through another 'Operation Lotus'. Parameshwara admitted there was discontent within the coalition government on cabinet expansion. Karnataka Deputy Chief Minister Parameshwara Friday accused the BJP of trying to destabilise the Congress-JD(S) coalition government in the state, which was facing discontent from within, but asserted that the ruling dispensation would complete its full five-year term. The BJP, he alleged, was trying to destabilise the government through another 'Operation Lotus,' "a tactic which will not work this time". He admitted there was discontent within the coalition government on cabinet expansion and portfolio allocation, but claimed it was "minimal" and could be managed. "Discontent is just only minimal...It is just minimal, we can handle it, no problem. It is not that big to remove the government," he told reporters after attending the 134th Founding day celebrations of the Congress party at the District Congress Committee office. 'Operation Lotus' refers to the controversial exercise carried out by the BJP during Mr Yeddyurappa's tenure as chief minister when opposition lawmakers were made to resign and join the BJP before getting elected again on the BJP ticket. "The BJP earlier did Operation Kamal. They were successful then. Same attempt is being made but ultimately they will not be successful. The tactic will not work this time (because) we are very strong. Our alliance is very strong and we will definitely complete our five-year term," he said. Senior BJP lawmaker Umesh Katti had on December 26 claimed that 15 disgruntled lawmakers from the ruling coalition were in touch with him and that the BJP would form the new government in Karnataka by next week. His statement came a day after senior BJP leader BS Yeddyurappa ruled out any attempts by his party to destabilise the Congress-JD(S) coalition government in Karnataka. The leader of the opposition in the assembly had said his party would take the "appropriate decision" if there was political instability in the state. 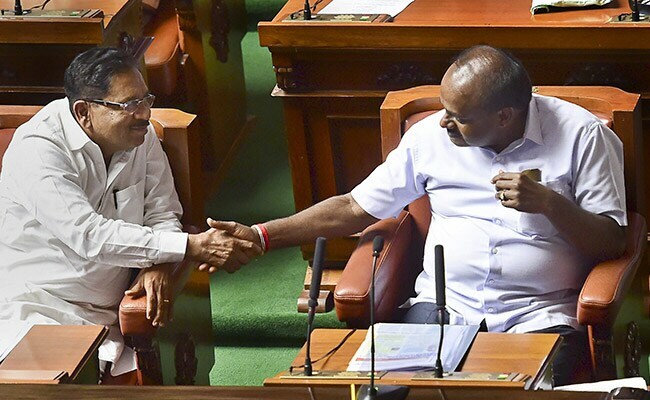 Mr Parameshwara also said there were "no discussions" within the Congress-JD(S) coalition on internal arrangement of having a Congress chief minister after two-and-a-half years. "There were no discussions like that. We have agreed to complete five years and will complete the term," he said when asked whether HD Kumaraswami would step down after two-and-a-half years to pave the way for a Congress leader to take oath as Chief Minister. The Congress leader said that the Congress-JD(S) coalition had agreed "in-principle" to fight the coming Lok Sabha elections together. "The formula on seat-sharing has to be worked out," he said.